Some kitchens need countertops that can endure whatever a family can throw at them. That's why so many people are choosing Caesarstone quartz countertops when designing their dream kitchens. Caesarstone quartz is an extremely durable and reliable option when compared to what else is out there today. What's more, this option doesn't disappoint when it comes to bringing beauty to a kitchen. Have you decided that you'd like quartz countertops in the kitchen you're building or redesigning? You can't shop around for quartz countertops without taking a serious look at what Caesarstone quartz has to offer. Discover all the reasons why Caesarstone should be at the top of your list if you're trying to design a kitchen that really works. You probably already know that quartz is one of the strongest materials you can choose for countertops. 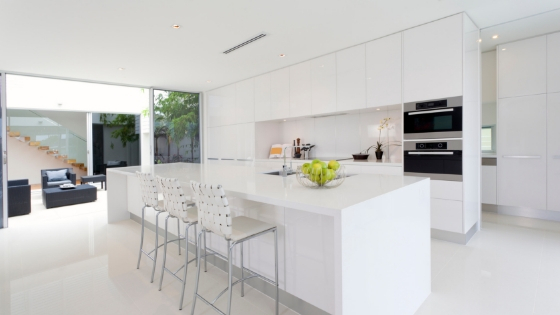 Caesarstone quartz is perfect for a busy kitchen because it is resistant to cracks and scratches. In addition, this material is resistant to stains. That's good news for anyone who is concerned about spills that could leave their countertops discolored. Caesarstone quartz is also resistant to both heat and cold. It's no surprise why so many people end up using this option when designing both residential and commercial kitchens. What is it that gives Caesarstone quartz so much strength? This product is comprised of 93 percent natural quartz. The remaining 7 percent is comprised of pigment and resin. The non-porous nature of quartz means that nothing can penetrate the surface. Nobody has time these days to spend hours cleaning their kitchens using specialty products and delicate techniques. The reality is that everybody wants countertops that can be easily cleaned without a lot of fuss. Caesarstone quartz gains bonus points for being extremely easy to clean. It does not require any sort of special maintenance. In fact, Caesarstone quartz can simply be cleaned using soap and water. Regular cleanings can leave quartz countertops looking completely spotless and shiny. Many people are surprised to discover that quartz is actually much easier to clean than granite. This is the case because quartz is almost 20 times less porous than granite. Caesarstone quartz is difficult to top when it comes to beauty. Quartz is beloved because of the way it offers natural beauty with a twist. The rich pigments that can be added to quartz make this option more versatile than options like granite. What's more, quartz can be designed to offer a uniform finish. Many people prefer the uniformity of quartz over the unpredictability that goes along with ordering granite countertenors. Of course, laminate countertops can’t even come close to offering the beauty and shine that you get with quartz countertops. What kind of kitchen are you dreaming of? It can be fun to explore options for kitchen styles that are modern, classic, clean or edgy. Caesarstone quartz offers a style for every type of kitchen. You can browse from what seems like an endless selection of countertop colors and patterns. Some people prefer totally flat hues that allow the rest of the kitchen to shine. Other people crave rich, highly textured countertops that serve as the focal point of a kitchen. There's no need to settle for anything less than what you want when shopping for Caesarstone quartz countertops. Most people assume that creating a new kitchen means enjoying that space for a lifetime to come. Nobody wants to think of redoing a kitchen again in just a few years. One of the best ways to ensure that a kitchen will last for a lifetime is to use quality, durable products. Caesarstone quartz comes with a lifetime warranty. That means that your investment is protected when you go with this option. Not many people realize that quartz can easily last a lifetime if it is installed properly. The fact of the matter is that your countertops are likely to outlive every other element inside your kitchen if you decide to go with Caesarstone quartz. When was the last time you were able to make a purchase with so much confidence? The bottom line is that you need Caesarstone quartz in your kitchen if you're focused on designing a beautiful, highly functional space that you can enjoy sharing with friends and family members for years to come. No other option out there offers so much peace of mind. You can rest assured that you're choosing a high-quality product that will endure all of the cooking and entertaining you have planned for the years ahead. What's more, this option is easy to clean without worrying about having to use harsh chemicals or abrasive tools. Beauty, quality and sophistication come together in Caesarstone quartz countertops.